When Tom Rigby is commissioned to paint a young woman's portrait at Woolvercombe House, the offer is too lucrative to refuse. But from the moment of his arrival at the secluded country mansion strange and inexplicable events begin to transpire. Soon he is drawn into an impenetrable maze of horror, and by the time he discovers the role he is intended to play in a diabolical design, it will already be too late. For the seeds of evil have been sown, and the time to reap their wicked harvest is nigh! 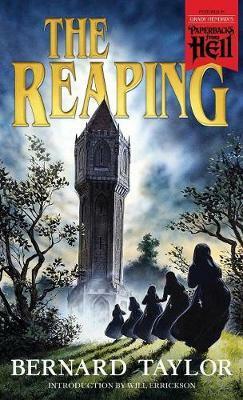 The classic third novel by '70s and '80s horror master Bernard Taylor, The Reaping (1980) returns to print at last in this edition featuring a new introduction by Will Errickson and the original cover painting by Oliver Frey.